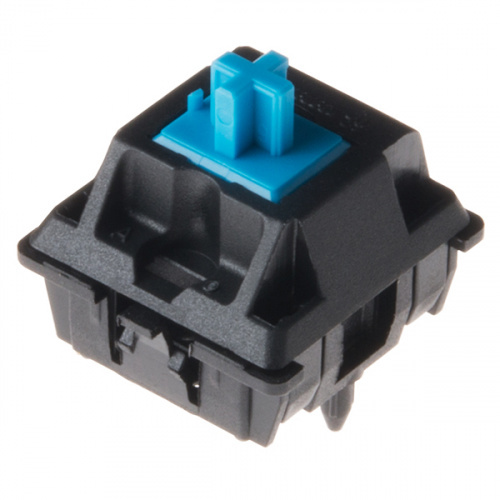 Cherry MX Keyswitches are top-of-the-line mechanical keyboard switches. They're satisfyingly "clicky", reliable up to tens-of-millions of key presses, and an essential component in gaming and programming keyboards. To help make the switches more easily adaptable to breadboard or perfboard-based projects, we created the SparkFun Cherry MX Switch Breakout. 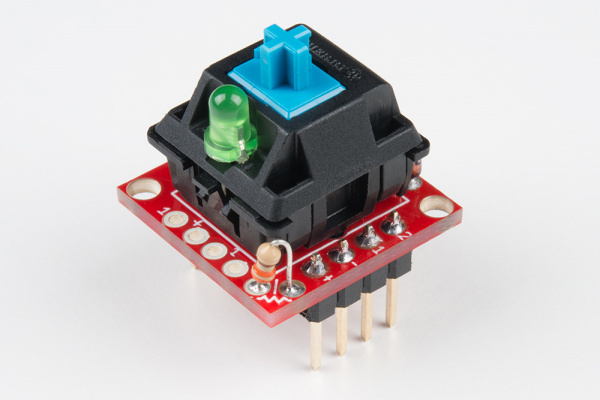 In addition to breaking out the switch contacts to breadboard-compatible headers, the breakout also provides access to an optional switch-mounted LED. 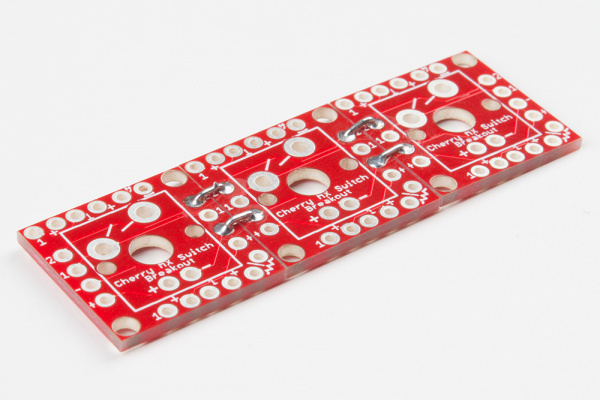 Plus, the pin break-outs are designed with keyboard matrix-ing in mind, so you can interconnect as many boards as you'd like into a row-column configuration, keeping the I/O-pin requirements as low as possible. 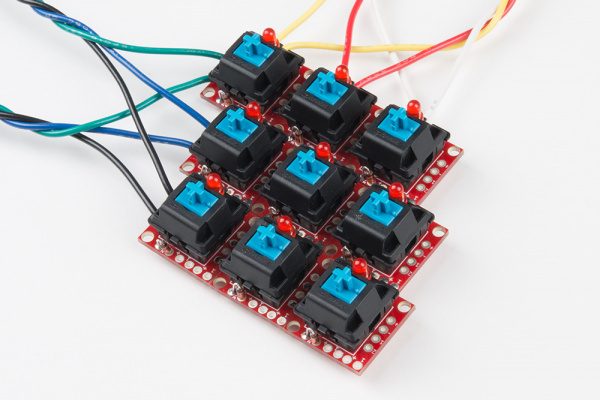 The Cherry MX Switch Breakout is a perfect prototyping tool for input devices ranging from a single key to fully-custom 101-key keyboards. 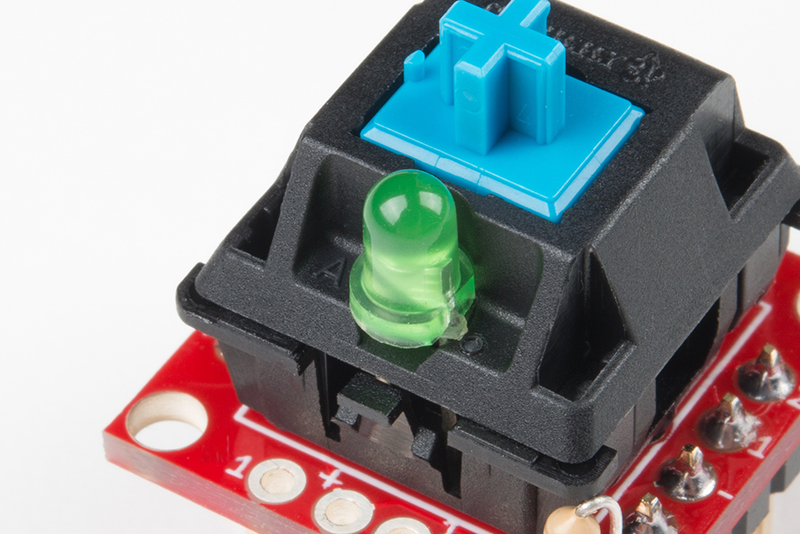 This tutorial documents the SparkFun Cherry MX Switch Breakout, providing an overview of the breakout, plus some assembly and usage tips. It's broken down into a few sections, which you can navigate around using the buttons on the right. 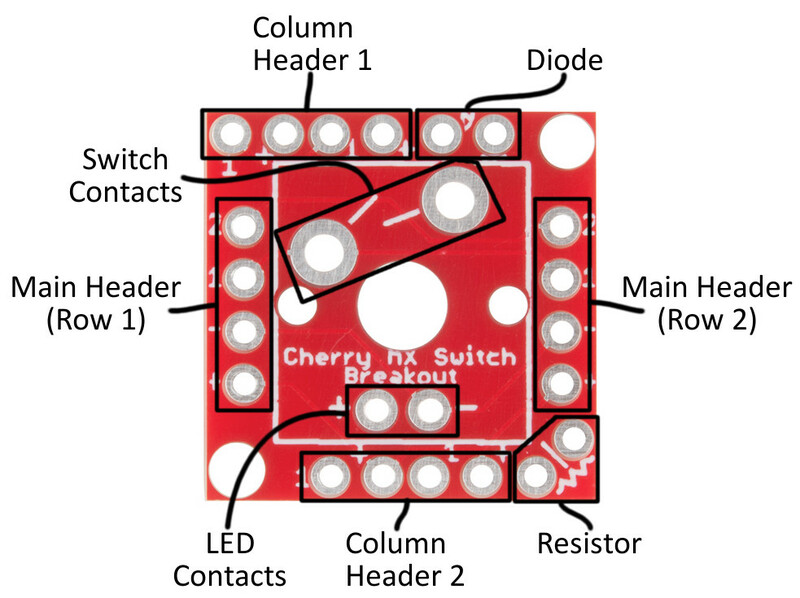 Hardware Overview -- A breakdown of the Cherry MX Switch Breakout Board features. Assembly Tips -- Tips for adding headers, wires, resistors, and diodes to the breakout board. Testing the Circuit -- A simple circuit to test the switch, LED, and any other components you may add on. Matrixing Breakouts -- A guide to combining two or more breakout boards into a row/column matrix, and scanning them with an Arduino. 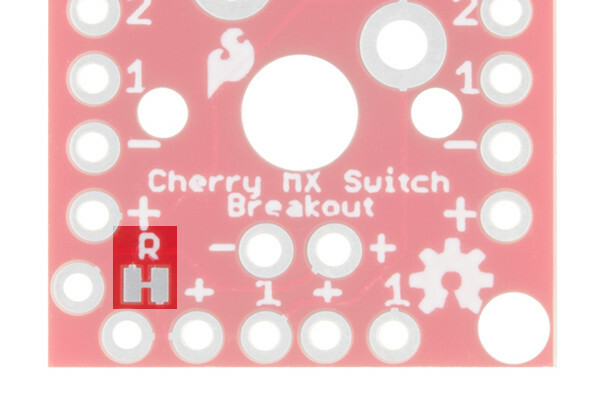 In addition to the Cherry MX Switch there are a few additional items you may want to add on to the Breakout Board. 3mm LEDs can be placed inside the switch. Pick any color you please: red, green, yellow, or cycling. 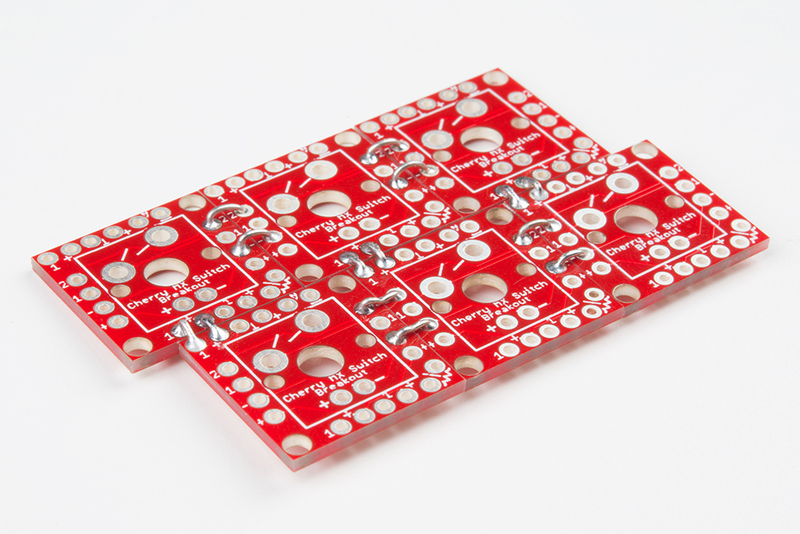 The breakout board also provides a footprint for an optional LED-current-limiting resistor. 1/6W PTH resistors, like these 330Ω's, are recommended. 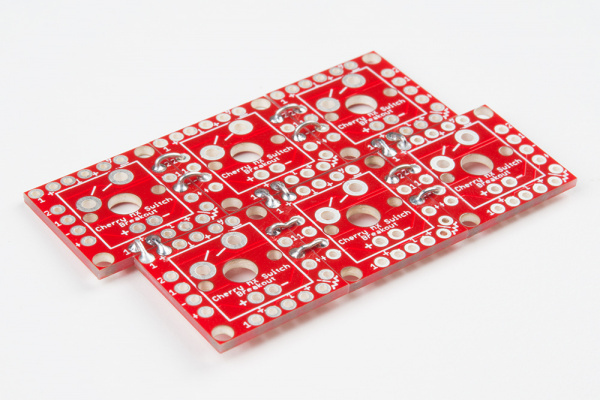 If you're matrixing multiple breakout boards together, you may want to add a small-signal diode to the board to help isolate the switches and prevent any possible "ghosting". Standard 1N4148 diodes should do the trick for this. If you need to tie the board down, it has mounting holes designed to fit 2-56 screws and nuts. You'll need soldering tools, including a soldering iron and solder. Other tools, like wire strippers, flush cutters, and a third hand, can also be helpful. Finally, headers or wire will help connect the breakout board to your breadboard or development platform. While it may seem like a simple breakout, the Cherry MX Switch Breakout board is a little over-engineered. Here's a quick breakdown of the pin breakouts and additional features of the board. If you only want to use the switch, the pins labeled "1" and "2" should be all you need. If you're integrating a 3mm LED, the LED's anode and cathode will be accessible on the "+" and "-" pins respectively. Every side of the breakout board is equipped with a four-pin header (don't confuse them with the diode or resistor pins), but not all of these headers are created equally! Two headers break out all four pins, while the other two headers only break out the LED anode and one of the switch contacts. The pair of headers on the left and right sides of the board break out all four pins. These are intended for primary use. 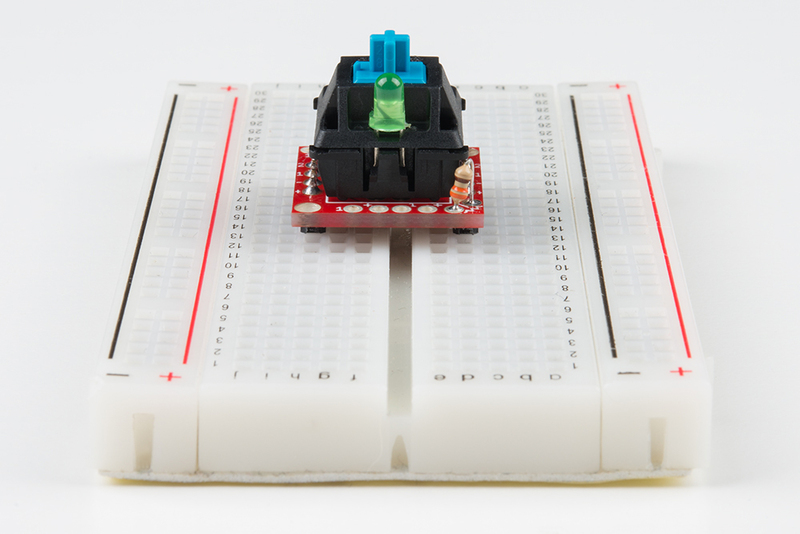 You can solder male pins into both of these headers, and plug the switch into a breadboard. The pair of headers breaking only the LED anode and switch contact 1 are designed for keypad matrices, where multiple boards are connected in row/column pairs. More on this later in the tutorial. To use the breakout board, at a bare minimum you'll need to solder the Cherry MX Switch and either headers or wires to the "1" and "2" pins. Male headers work well for most breadboarding applications, while solid-core or stranded wire work well if you're wiring the breakout up to something afar. There are plenty of other addon options, including a 3mm LED, current-limiting resistor, and switch isolating diodes, which are all documented below. 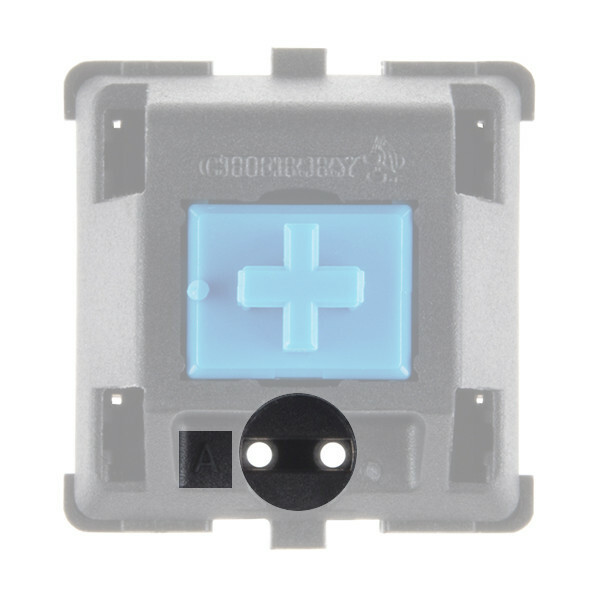 Most Cherry MX Switches -- including the blue, MX1A-E1NW switch we carry -- have a recess in their body designed to fit a small 3mm LED. An "A" on the top side of the switch and a diode symbol on the backside both show the recommended polarity of the LED. The LED's recessed home in the switch. Note the "A" indicator for the LED's "anode." To add an LED to the switch, insert the anode and cathode legs of the LED into their respective pins -- the LED's longer, anode leg should be inserted into the "A" pin -- then flip the board over, and solder the LED to the breakout board. If you're adding an LED to the switch, more likely than not, you'll need a current-limiting resistor. 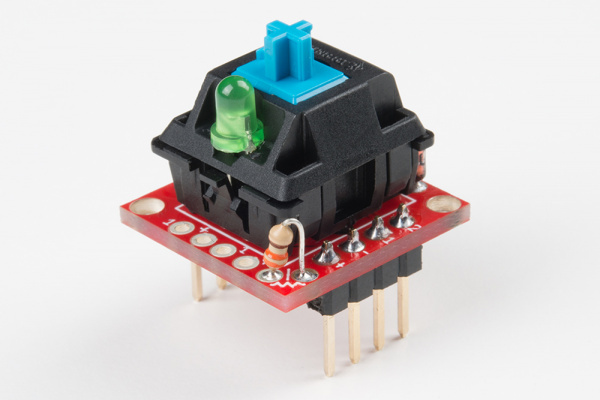 The breakout provides a resistor footprint, in-line with the LED. You'll find the resistor pads on the bottom-right corner of the board. Small PTH resistors are recommended for this application – 1/6W or 1/8W through-hole packages work best. 1/4W resistors can be too large – potentially interfering with any keycap that may be on the switch. You'll also need to cut the "R" jumper on the back side of the board, which might be easier to do before you solder anything. A hobby knife and a steady hand should do the trick. By default, the board has a short across the current-limiting resistor. Cutting this jumper removes the short, and functionally adds the resistor to the circuit. 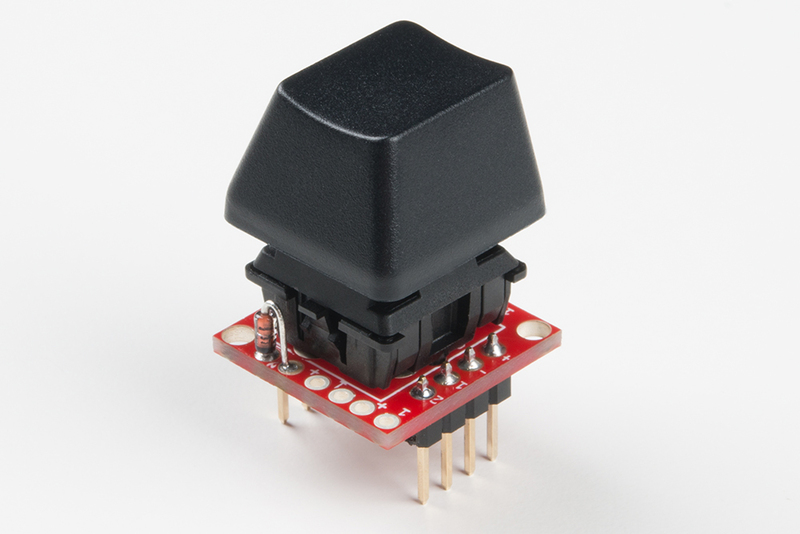 If you plan on interconnecting four-or-more breakouts -- creating a row/column matrix of switches -- you may also want to consider adding a small-signal diode to help prevent "ghosting". The 1N4148 small-signal diode is perfectly fit for this task. 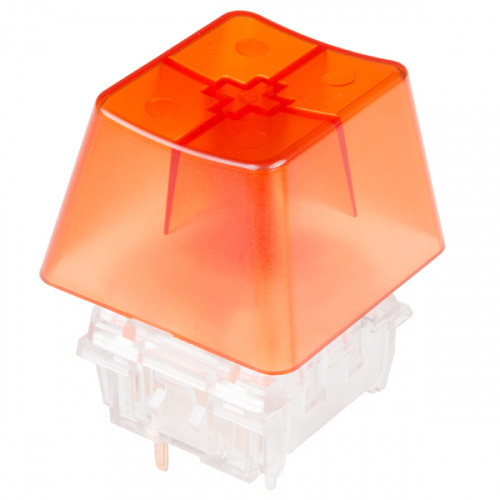 "Ghosting" is a problem that can adversely affect the detection of multiple, simultaneous button presses. Without diode protection, certain combinations of simultaneous button-presses can cause one-or-more un-actuated buttons to appear pressed ("ghosted"). The result is a false-positive key-press, which can cause undesired behavior in a project. 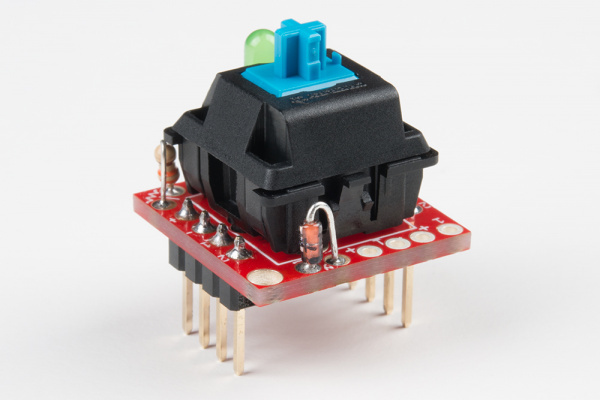 To avoid button ghosting, small-signal diodes can be placed in-circuit, after every key. The diode prevents a key's signal from "backfeeding" back through the line. While the diode does prevent ghosting, it does place certain restrictions on your button-press detection. It forces the switch contact on the diode's anode (positive) side to be at a higher voltage than the other contact, as the switch can only conduct meaningful current in one direction. For more on keypad ghosting, check out Byron's explanation in the Button Pad Hookup Guide. A small, "vertical" diode footprint is broken out in the upper-right corner of the board. Near one of the pads in this footprint, a small, white line designates which pin should be connected to the diode's cathode (negative) pin. To solder a diode into the board, bend the anode leg down, so it's parallel with the cathode leg. Then insert the diode into the board -- making sure to place the cathode leg (usually indicated by a black bar) into the marked hole. Like the resistor, the breakout shorts across the diode. Cutting this jumper removes the short and functionally adds the diode to the circuit. 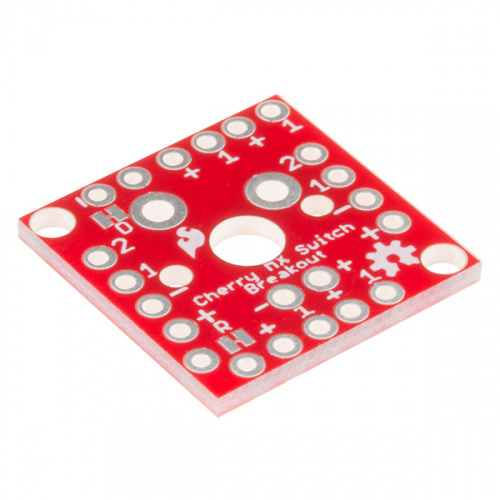 A pair of mounting holes are provided on opposite corners of the breakout board. These holes are designed to fit 2-56 (3/8") screws. Flat heads are recommended, though rounded heads can work as well. If you're going to be doing a lot of jamming on your keyboard, you'll want it tied down! Now actuate the switch, and watch for the LED to illuminate. Note that, if you've added the ghosting diode, this is the only polarity in which the switch will work -- pin 1 must be at a higher voltage than pin 2. 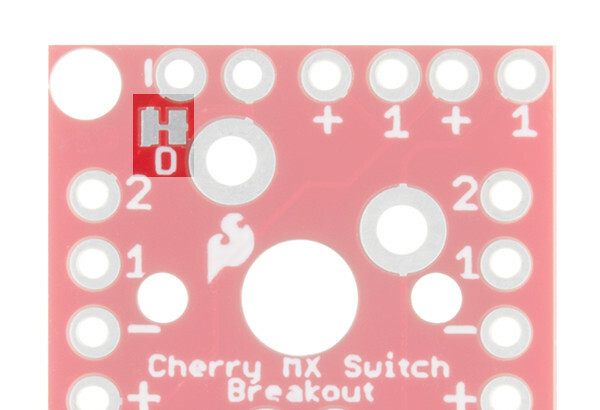 The Cherry MX Switch Breakout Board's are designed with switch matrix-ing in mind. 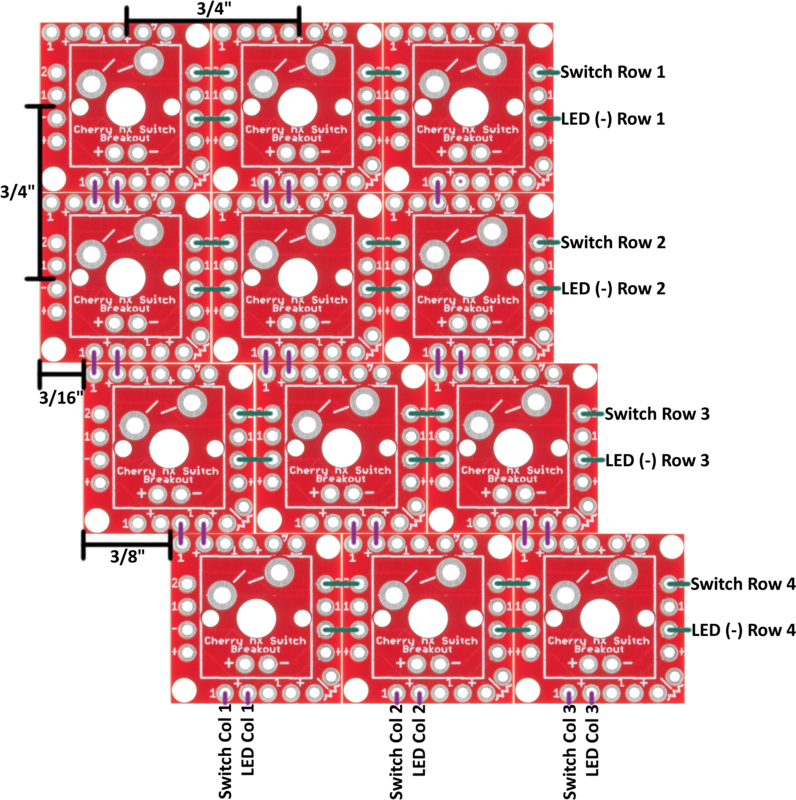 By creating a row/column matrix of switches, you can save on potentially dozens of microcontroller I/O pins. A 64-key keyboard, for example, can be scanned with just 16 I/O pins. 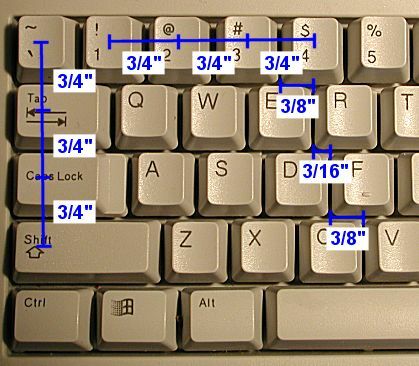 While there is no specific standard for keyboard key spacing, most full-size keyboard keys are spaced by 3/4" (0.75in) from center-to-center. Rows may be offset by either 3/8" (0.375in) or 3/16" (0.1875in), or not at all. The breakout is designed to make typical key spacing as easy as possible. By cleverly jumping one board to the next, you can add any of the standard offsets to nearby rows. So, plan out your keyboard, and grab a soldering iron! There’s not an easy method to soldering boards together. You’ll probably need wire strippers to split and cut solid-core wire into tiny (~3/8") pieces. A third hand can be a big-time help keeping boards stationary while you solder the little wires in place. Once you've created your rows, line up the columns by matching the "1" and "+" pins. There are three offset options available, as documented in the image above. Here is an example of a fully built-up 3x3 matrix. The middle row is offset from the top by 3/16", and the bottom row is offset from the middle by 3/8". 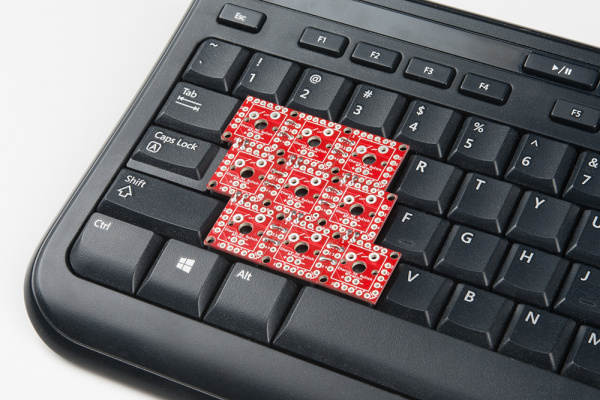 This will make the middle row equivalent to a keyboard's A, S, and D keys, the top row Q, W, and E, and the bottom row Z, X, and C -- we're making a 9-key keypad centered around WASD! Finish off the soldering job by connecting wires to the row and column pins you'll need access to. If you're not using any LEDs, you'll only need to solder to the "1" pins along the rows, and "2" pins along the columns. 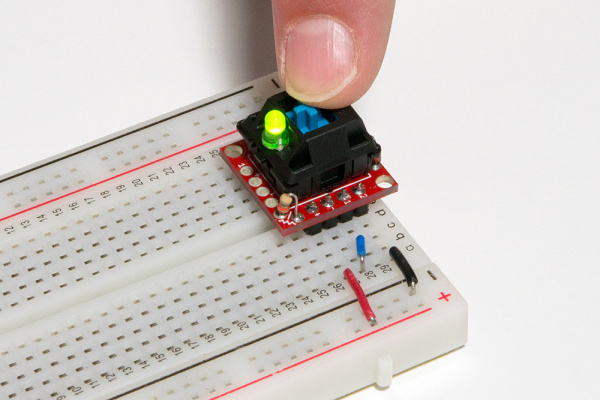 Don't forget to add your switches, and LEDs, resistors, or diodes, should your project require them! Here's a simple Arduino sketch, designed to work with a 9-key, 3x3 matrix, but easily expandable for larger keypads. It may look like a mess of wires, but -- with 9 switches and LEDs -- we've at least turned 18 wires into 12. // of the matrix, kept track of using the currentRow variable. // Select current row, and write all components on that row LOW. // That'll set the LED anode's LOW, and write the switch "2" pins LOW. // Look at the LED_buffer variable along this row. // If any column is 1, turn the LED on. // Read the button. If it's pressed, it should be LOW. // by writing them HIGH. // LED select columns - Write HIGH to turn an LED on. Whenever you press a switch, the LED on that switch should also light up. Releasing the switch turns the LED off. The code is adaptable for larger or smaller matrices, with a few modifications towards the top of the sketch. 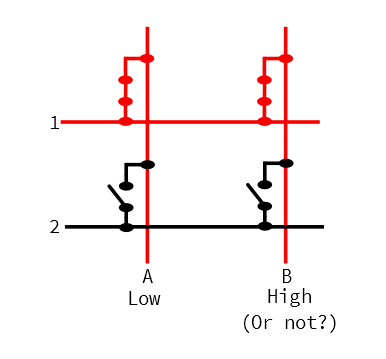 If you've added ghost-prevention diodes, keep in mind that the switch's "1" pins (organized as the columns) must be at a higher potential than the row, "2" pins. To scan the keypad matrix, we recommend pulling the row pins high using a pull-up resistor (often internal to I/O pins). Then progressively pulling the column pins to ground and checking which of the rows, if any, are pulled low as well. 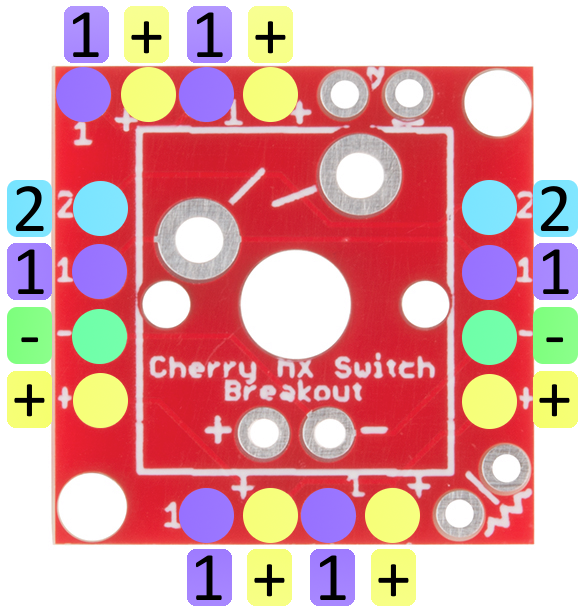 The Cherry MX Switch Breakout Board is open-source! If you want to check out the schematic or PCB design files, feel free to peruse our GitHub repository. Once you've completed your keypad, consider topping off your keys with a keycap. There is a ridiculous variety to Cherry MX keycaps -- they vary by color, translucence, height, labels, and size. There are plenty of keycap sources out there, including WASD Keyboards and MechanicalKeyboards.com. Or consider adding a key that is four times its normal size to your project! 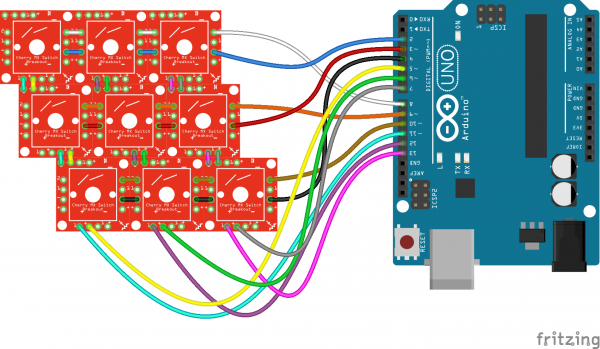 An introduction to being able to trigger music and sound effects based on buttons, sensors, or switches using the WAV Trigger board. Or check out this blog post for inspiration and 3D print your own keycap.